...but also an artist in his own right Fr. Ralph is. In addition to being the rector of Notre Dame's oldest and most storied residence hall, Fr. Ralph is also a consultant at University Relations, and it is there that he was a part of group who devise the creation of one man play about Fr. Sorin all for the 175th anniversary of the University's founding. 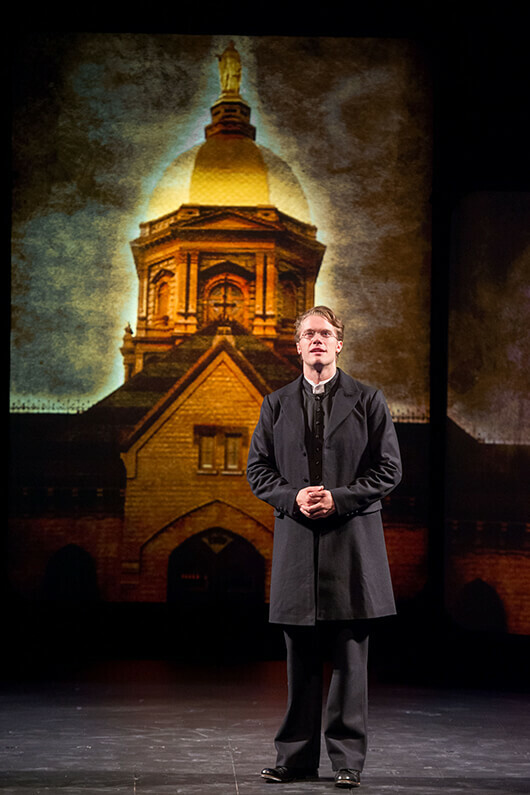 Entitled Sorin: A Notre Dame Story, the play can be seen almost every weekend at Notre Dame, and it's all free! Can't make it Notre Dame, no worries. The play will come to you! Yes, that's right. The play is hitting the road, visiting Notre Dame clubs around the country for the next two years. On the play, Fr. Ralph said, "In the beginning, I wasn't sure this was going to work. A one man play? No thank you! But in all honesty, this play has exceeded all of my expectations, and I have learned much from it. Of course, I made sure that St. Edward's played prominently in this work...how could I not?! I encourage everyone to see it. And I am volunteering to join the cast and crew when the play visits the ND clubs in Miami and Orange County." To learn more about Sorin: A Notre Dame Story, click HERE. To secure free tickets to an on campus showing, click HERE.